This tool provides the opportunity to gain valuable ideas to build upon existing philosophical and program practices. This online tool allows visitors using a desktop computer (Mac OS/Windows) or a mobile device (iPhone/iPad/Android) to take a self-guided panoramic virtual tour of the entire preschool classroom. 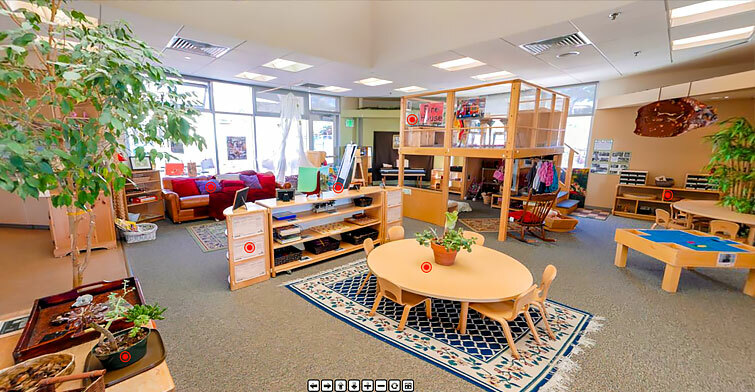 Explore the classroom through the 360° panorama, then delve into visual media and related resources of the five defined Key Elements that make up this High Quality Early Learning Environment (HQELE). Navigate areas of the classroom by zooming in for a closer look at materials and room arrangement. Use the onscreen navigation controls at the bottom of the screen to move around the room. Select a hot spot ( ) to explore one of the Key Elements. These hot spots represent a sample of each particular Key Element within the panoramic virtual tour. These panoramas provide a closer, detailed look at specific learning areas of the classroom.